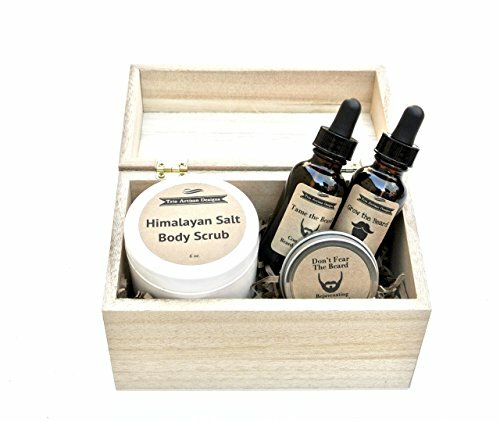 The perfect grooming gift set to take care of men's skin and beard, it comes with beard & mustache oil and balm to keep his facial hair in great shape, and choice of Himalayan salt scrub or coffee scrub to exfoliate and moisturize the skin, all packaged in an unfinished wood box tied with rustic twine. Tame the Beard- conditioning beard and mustache oil with grapeseed oil, apricot kernel oil, sweet almond oil, and argan oil to provide deep conditioning and moisturizing, reduce frizz, increase shine, and are hypoallergenic and rich in vitamin E. Light sandalwood scent. Grow the Beard- nourishing beard and mustache oil with a blend of grapeseed oil, safflower oil, rice bran oil, and apricot kernel oil to strengthen and protect facial hair from outside free radicals, helping promote hair growth. Smokey cedar scent. Don't Fear the Beard- a refreshing blend of tea tree and eucalyptus essential oils with shea butter, coconut oil, rice bran oil, and sweet almond oil to help promote hair growth and reduce hair thinning, strengthening and nourishing facial hair. Sweet Java Scrub- coconut oil and sweet almond oil with coffee and brown sugar for a nourishing, lighter exfoliant for face and body. 4 oz. Comes in a hinged, unfinished pine box tied with rustic twine, measures 6.7 inches long by 3.75 inches wide by 4.5 inches high. If you have any questions about this product by Trio Artisan Designs, contact us by completing and submitting the form below. If you are looking for a specif part number, please include it with your message.